Politics on social media – as in real life – isn’t always pretty. In an election season marked by partisan animosity, a recent Pew Research Center report found that many social media users describe their political encounters online as stressful and frustrating, and nearly four-in-ten have taken steps to block or minimize the political content they see from other users. 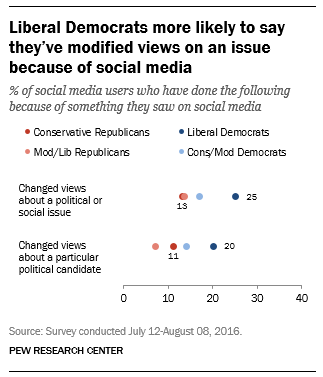 But despite the downsides, exposure to the range of new ideas and viewpoints that many social media users encounter can occasionally cause people to change their minds about political issues or candidates. In addition to asking whether they had changed their minds in this way due to social media content, our survey also asked respondents to tell us – in their own words – about a recent time this happened to them. And when we coded their answers, we found a number of distinct themes that emerged in the issues that came to mind. Moreover, people who said they had changed their minds on these candidates often said that social media pointed their opinion in a more negative direction. Respondents who indicated they had changed their minds about Clinton were more than three times as likely to say that their opinion changed in a negative direction rather than a positive one (24% vs. 7%), and respondents who mentioned Trump were nearly five times as likely to say that their opinion became more negative as opposed to more positive (19% vs. 4%). Still, it is important to note that the majority of social media users are not swayed by what they see in their networks. 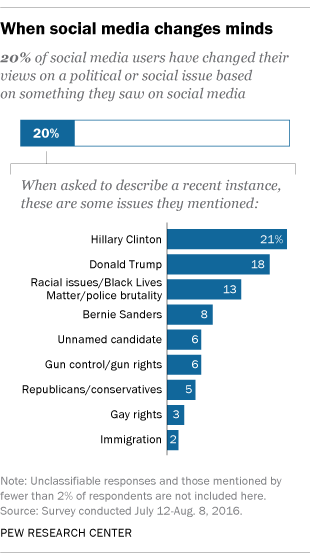 Some 82% of social media users say they have never modified their views on a particular candidate – and 79% say they have never changed their views on a social or political issue – because of something they saw on social media.